Changes torch lighting to be less harsh up close and more useful at a distance. Improved compatibility with Smart Magic Lamp 3.31 and above. Added Latin American Spanish localization to the optional menu (thanks to Auldrehn). Fixed a misspelling in the English localization of the optional menu. Added an optional GUI menu for tweaking various torch settings, with presets tailored for popular lighting mods. Added a new system to change torch intensity, both globally and by game area, using the optional GUI menu. Added the option to cast more shadows near the torch, enabled using the optional GUI menu. Improved torchlight uniformity across the game and with different lighting mods. Torch intensity now decreases more naturally with distance. Added a secondary light source to the torch to improve light distribution. Slightly increased light intensity near the torch. Fixed torch being too dim when used in the Toussaint region. A rework of the torch lighting using two separate light sources. The first light does much the same as the original but is less intense, so as to not risk overexposing Geralt's beautiful complexion. It serves to light up nearby objects with a strong yellowish light in typical torch fashion, but is limited in range. The second light is faint but reaches further, lighting up your surroundings with ambient lighting that greatly helps navigate in pitch-black conditions like caves and such. This light really stretches out, possibly reaching up to 50 meters, but is dim enough not to be unrealistic or overly distracting. 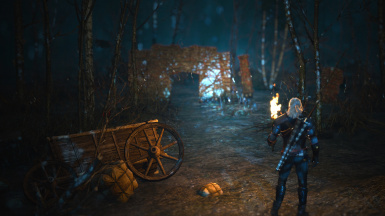 It also works in Toussaint now, unlike the original which didn't light up much beyond Geralt's feet. If installing the optional menu, copy the bin folder inside the mod into your game folder. Install the optional menu, navigate to the mods option menu once ingame, and then configure manually or use a preset. The lighting is balanced for the base game. 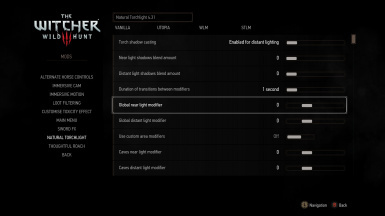 If you use a lighting mod it might not look as intended, though you can use the optional menu to improve on that. If you think you've found a bug please report it by leaving a comment.